West Germany is easy to travel in, or through. With a plethora of road alternatives, friendly and forthcoming people, nice small cities, it’s quite enjoyable. Accommodation normally isn’t any problem. What might be tough is to get motorcycle service done during summer. Especially if you’ve not booked, good time in advance. It depends on where in West Germany you go. 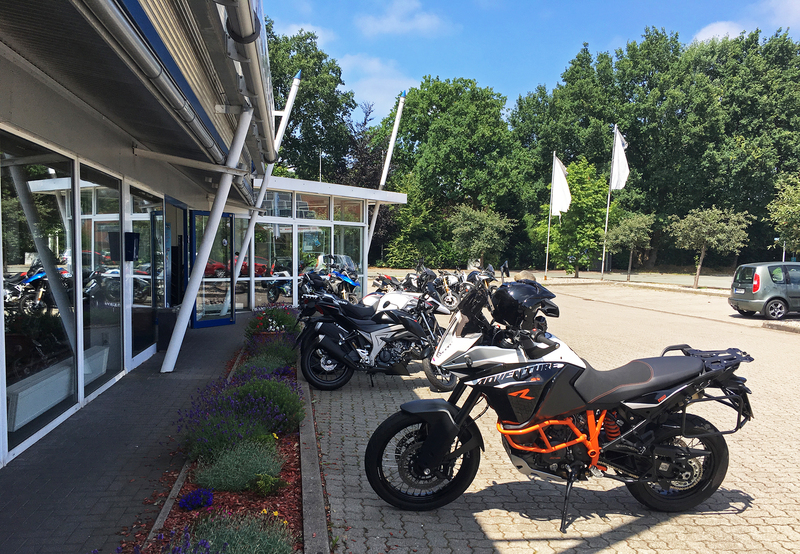 Summer is, like in so many other European countries, high season for those in the motorcycle business. West Germany is no exception, despite a lot of dealers, good or excellent workshops. It’s a large country with a lot of customers who needs service done, and most want it done, during summer. Turned out to be a little bit more challenging than I’d imagined. Prior to my departure by more than a month, a dealer used in 2016 was fully booked till August. Searched for another in the same region. BMW Motorrad in Hamburg found time, but then I’d have to go in/out of Hamburg. Not my first choice, although I am confident it would have been a good one. Bergmann & Söhne in Neumunster had time on a desired date. They’d had gotten good reviews online, and was on the trajectory of my “planned” direction. Spent one night in Neumunster. Never been there before, wandered off a bit in the afternoon and evening. Made an early return back to the hotel. Knew the next day and leg would be pretty long, maybe even eventful. Arriving at the BMW dealer in the morning I was greeted by a friendly service consultant. Not brilliantly proficient in English, but with a little German it worked out fine. The service was done according to best practice and finished according to scheduled time. Saved a few quid compared to service in Norway, but not much more that that. Anyhow, it was done and the adventure could commence. Hamburg, being the second largest city in Germany, is a major traffic congestion area. How bad depends on when you pass, time of the day, and/or time of the year. The situation might also relate to Autobahn roadworks. I had decided to avoid Hamburg, with its major autobahn roads, and head west, to Glückstadt (English; happiness city). Nice little town, people seemed happy enough! Or at least those I saw at the main square during a coffee & lunch break. 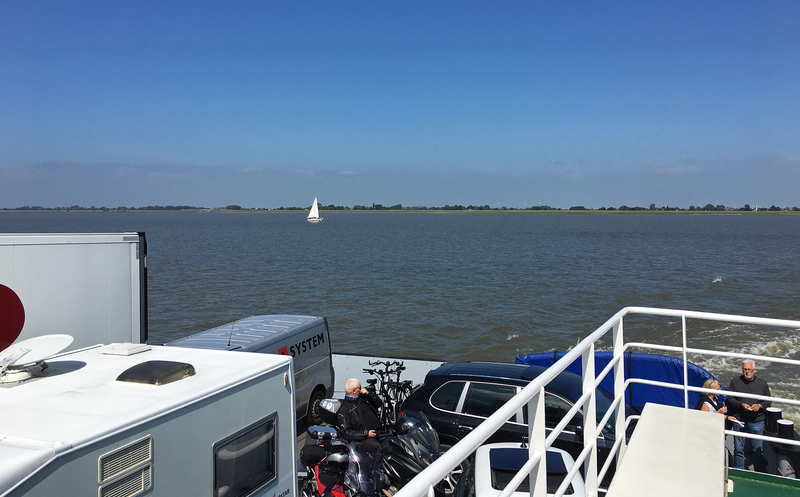 A wee northwest of the city center there is a ferry that takes you across the river Elbe to Wischhaven. This option lets you escape potential traffic hell and roadworks in or around Hamburg. The crossing takes around 25 minutes. Elbfahre Gluckstadt – Wischafen. Worth a try! Landed on the other side I set course south. About one and a half hours later fate intervened.. I was heading south not too fast, with no stress, and no hurry. Hadn’t decided on where to stop for the night. it was still relatively early in the afternoon, the weather was great, the small roads were great. Came into an intersection between the small road and a bigger one. It’s what they call Bundesstraße in German. I had a car in front of me, so slowed down to almost halt, checked to the left. No cars there. I think I might even have stopped full, but here memory fails me. Observed that the driver in front was making a move, so checked again to the left. Still no cars from left. Accelerated slightly. In the corner of my eye I saw the guy in front had stopped or slowed down, ouch! Impact shattered the front, lots of plastic, electronics etc..
Too late…tried to throw the bike out to the right.. alas…BANG. I rear-ended the car in front, just where the lights are. Felt a heavy thumb, my left leg banged into the cylinder. Don’t know if you, the reader, know how this feeling is. Before any pains hits you, because Dopamine production spikes just a millisecond after your nervous system has registered an impact. Shaken I dropped the bike, fortunately it’s well protected and the drop was slow. A guy who came behind me stepped up to help. Under normal circumstances I’d be able to do it alone, well maybe. Now an extra set of hands was good to feel. Think it would be fair to say the circumstances for the accident hardly could have been more benign. The guy I rear-ended was calm and polite, the guy who came up behind me was calm and polite. Asked me in German if I was ok. Neither spoke much English but the policeman who arrived shortly after did. He too was calm and polite. It was a no-brainer happening. I had rear-ended the car in front, the damages on the car were relatively minor. 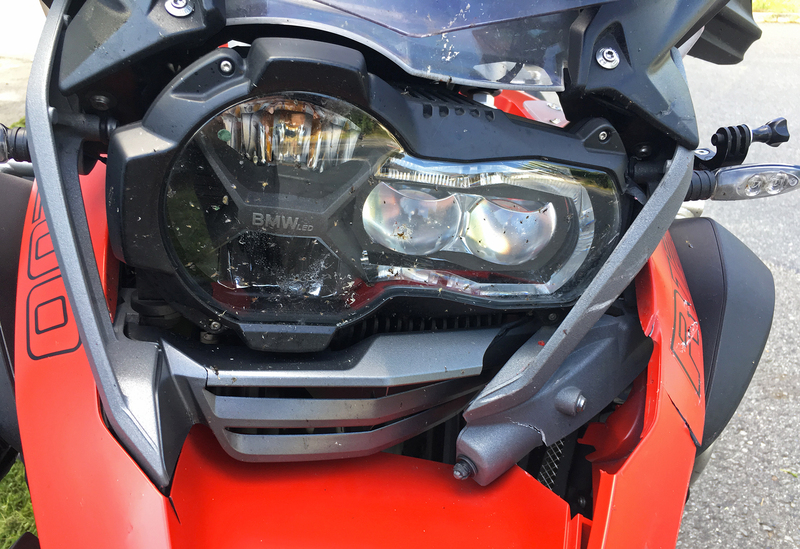 The damages on my motorcycle, although not minor, hadn’t caused any serious riding, or geometry, damage. At least none I could see. The policeman said I could just ride on. Despite a hurting, pounding, bruised leg nothing was broken. So I hopped on and took off, well.. slowly. On the BMW Motorrad International Service page I’d located a BMW dealer not too far off. Tried to find the place but after 2 attempts I gave up. 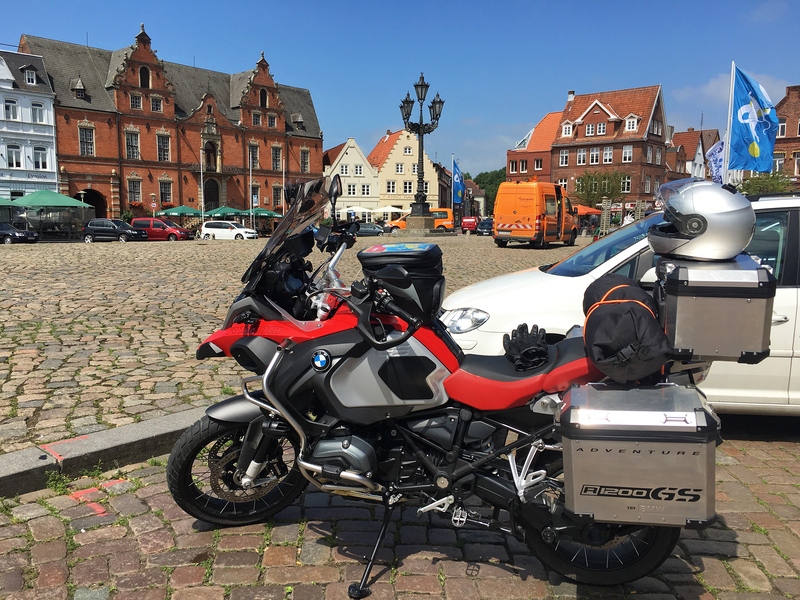 Then made the decision to go to the nearest BMW Motorrad HQ location, which was in Hannover. And hoped to get aid and help there. So, onto the Autobahn and rode on, down to Hannover. Found a hotel, just across the street from the massive BMW divisional location, the size of a city block. The next day “shicksal” or fate of my onward adventure would be decided. 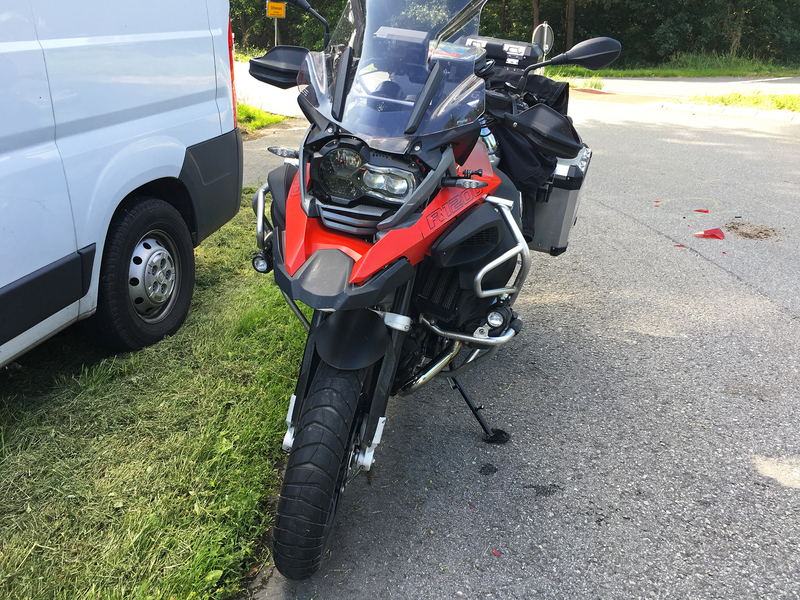 Would BMW Motorrad be able to help me out? It could mean the end of of the adventure, or not.. 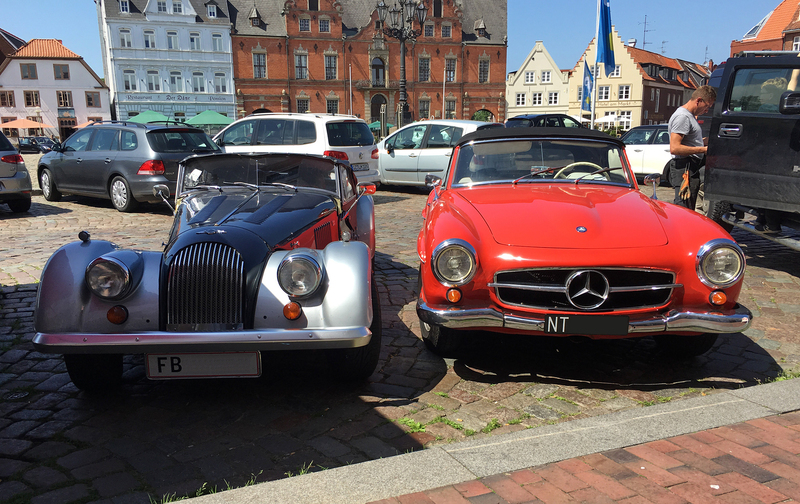 This entry was posted in MC rides, trips & adventures and tagged Adventure, fate, Germany, MC related, MC riding, Vacation. Bookmark the permalink.